Though there may be vast, technically recoverable oil and gas reserves beneath the sea north of the Arctic Circle there are enormous challenges when operating in such a harsh environment. Neil MacDonald reports. Geohazard surveys are standard practice prior to offshore drilling in all seas as they detect the presence of shallow gas-bearing formations, active faulting and potential hydrate zones but the presence of permafrost under the seabed in this region, which could create unstable foundation conditions for natural gas production and gas rigs, poses an additional difficulty for operators. One area under investigation for oil and gas resources includes the Beaufort Sea, north of Canada's Yukon and Northwest Territories. The technique used to investigate the seabed layers is a seismic survey using reflected acoustic signals to create a two-dimensional (2D) 'picture' or sub-bottom profile which is used to map the geological boundaries. 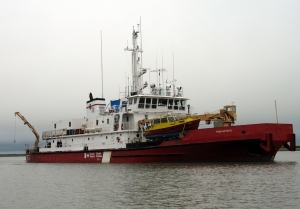 In the summer of 2008, when there was little sea-ice present, work was carried out by the Canadian Coast Guard vessel Nahidik under the auspices of the Geological Survey of Canada's (GSC) geohazards mapping programme lead by Steve Blasco. 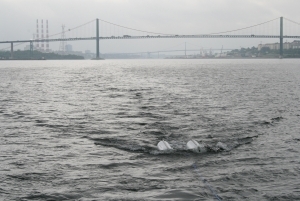 Their private partner, Canadian Seabed Research Ltd. (CSR) based in Nova Scotia, handled the recording part of this mission. Canadian Seabed Research is a well established company of geophysicists, hydrographers and survey engineers operating worldwide undertaking a variety of marine geophysical surveys including precise positioning, pipeline and cable route surveys, seafloor imaging as well as sub-bottom profiling. 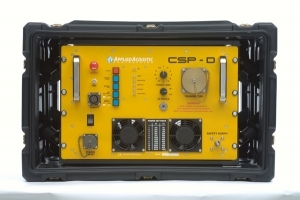 The equipment selected for the sub-bottom survey was an Applied Acoustics' CSP-D power supply, a Squid 2000 sparker array, CSR's 12 channel streamer with Geode data logger. The data logger was controlled by a shoot-on-distance interface from the ship's Hypack navigation system. The CSP-D seismic power supply is one of a range from Applied Acoustics which have a distinguished record of performance, double layers of safety circuitry and a valuable 'soft start' to gradually increase the power output easing the load on the generator. It also has a unique dual voltage output providing exceptional versatility with boomers as well as sparkers. "We have worked with the CSP seismic energy sources from Applied Acoustics before for some inshore work," said Ray Burke, CSR's Research & Development Manager, "so we were confident the unit would provide minimum reverberation, consistent pulse shape clarity and good results," he added. The Beaufort Sea is generally shallow and sub-bottom permafrost is known to occur out to a depth of 80 metres. The study proved this area was no exception with permafrost occurring as shallow as just 25 metres in places. Another issue encountered by the team related to the use of the sparker array. In the outer Mackenzie Delta the presence of plumes of fresh river water had the potential to render the sparker inoperable because of reduced conductivity. However, luckily, only one recording interruption occurred that was attributed to this phenomenon. Tony Atkinson of the GSC confirmed that about seven continuous days of surveying were carried out successfully using the Applied Acoustics system. "Initially power was held to 1500Joules," he said "because we were unsure what the rate of wear would be for the 120tip Squid. Although we were shooting on distance, the fire rate was about three seconds. The array was recovered once a day for inspection and it became clear near the end of the job that tip wear was minimal, so with nothing to lose, the sparker was fired at the full 2400Joules for the last day of the project. " "Initial processing of the Multi Channel Data is complete," said Pat Campbell, CSR's Beaufort Project Manager, "we are currently interpreting and integrating the 2008 seismic data with previously collected data from the area." The subsea permafrost knowledge gained from this study is important to those wishing to develop the area in future years. A second survey of Multi Channel seismic and high resolution analogue data collection is planned for the summer. Having confirmed the signal to noise and resolution was a major improvement with this system compared with earlier investigations, the goal in the follow-up survey will be for CSR to maintain the high power into the Squid 2000 in anticipation of obtaining better penetration. Applied Acoustic Engineering is a leading company in the design and manufacture of a wide range of subsea navigation and positioning products, and marine seismic survey equipment. The extensive product range includes the innovative USBL tracking system, Easytrak, a variety of positioning and release beacons and seismic devices for offshore geotechnical and seabed analysis known as sub-bottom profiling. All products use acoustics, underwater sound waves, in location, positioning, navigation and data acquisition applications. Applied Acoustic Engineering will be exhibiting Underwater Intervention, Location: New Orleans, USA, between 17th-19th February 2010 and at Oceanology International at the London Excel between 9th-11th March 2010.